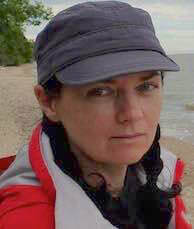 Marla J Dominey is a native of Cape Breton Island, Nova Scotia. She holds a Diploma in Commercial Design and has worked in advertising and as a freelance graphic designer. After a hiatus to raise children, earn a university degree and write a book she has returned to painting where she plans to work mostly with acrylics on canvas. Marla lives and works in the beautiful Niagara Region.